Fatalities caused by falls from elevation continue to be a leading cause of death for construction workers, according to data from the Bureau of Labor Statistics. In an effort to mitigate injuries and fatalities, the month of March is being recognized as National Ladder Safety Month by the American Ladder Institute. Working professionals, ladder manufacturers and government organizations are collaborating on this awareness initiative.March was chosen as it signals the start of spring home improvement projects and the beginning of construction season. It is also an appropriate lead-in to OSHA’s National Safety Stand-Down to Prevent Falls in Construction, which will span May 8-12. The hope is to decrease the number of ladder-related injuries and fatalities, lower the rankings of ladder-related safety citations on OSHA’s annual Top 10 citations list and increase the number of companies that inspect and properly dispose of old or damaged ladders. When working at elevated heights, it is important to first determine what type of ladder is appropriate for your current work environment. Confirm that the ladder is the appropriate length for the task. 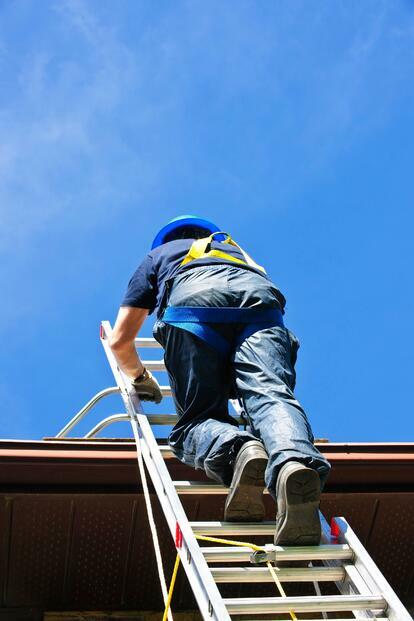 Then check that your ladder has the proper duty rating, thoroughly inspect the ladder to ensure it is in good working condition, and clean the climbing and gripping surfaces. As you work to complete your task, remember to follow the three points of contact rule — maintaining one hand and two feet, or two hands and one foot, when climbing or descending the ladder. The OSHA standard for stairways and ladders contains specific requirements designed to ensure worker safety. To view those requirements, click here.